Journey across the stars, crashing your Star Cruiser into a series of increasingly dangerous, procedurally generated planets. Explore their hazardous surfaces as you rescue your stranded crew, salvage lost cargo, and zap hordes of enemies. Can you survive long enough to reach the Mysterious Planet X? Or will you be consumed by a slime, zapped by an enemy blaster, boiled in acid, or choked to death by a toxic atmosphere? Several secret bonuses you'll need to discover! As you delve deeper into space, the planets will expand in size, add more difficult room layouts and variations, increase the chance for high gravity, unlock new hazardous biomes (including burning lava planets, sliding ice planets, and rare toxic atmospheres! ), more challenging enemy variants, more enemy crew, and fewer useful items to help you along the way. While the first few planets might not cause you much trouble, by the time you reach the Mysterious Planet X, you'll need the skills and bravery of a true Space Ranger to survive! Humans are boring! While they're the most common species in the Space Rangers, the other sentient species have special bonuses to help in their adventures. Along with all the random features of each planet, you'll need to accustom yourself to the unique ability of your randomly chosen cadet. Can you reach the Mysterious Planet X with a cadet from every species? Game by @tmi_robot. For developer logs and other information, search #littlespacerangers on Twitter. 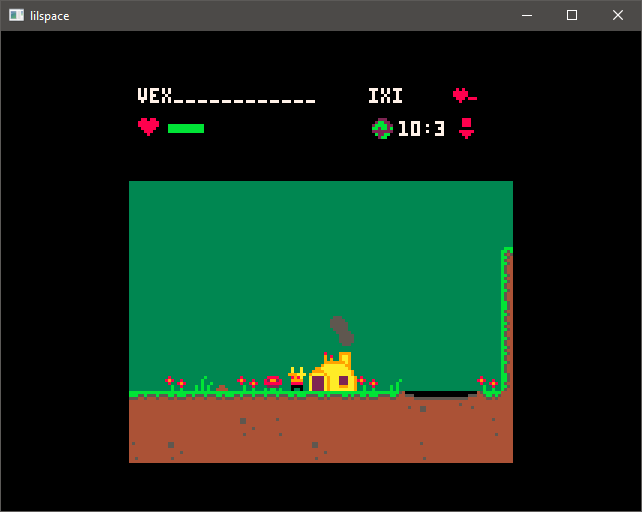 Uses portions of @matthughson's Advanced Micro Platformer library, which can be found here https://www.lexaloffle.com/bbs/?pid=46229. I'm not sure if you're still around, but I came back to this game recently and finally completed the brutally difficult hard mode! Congrats and thanks for playing! Hi! I was playing the game on normal mode as a Fuzzi and completed one planet, and I became an Ixi when I advanced to the second planet because I pressed Z instead of X to begin the second planet. I figured that this is a bug you'd like to hear about. I'm really enjoying this game, though! Ah! Nice catch! Uploaded a new version with a fix.